John Boit Morse (1912-88), son of Samuel F.B. Morse, the developer of the Pebble Beach Golf Course, was a graduate of Yale University, a semi-professional hockey player, a World War II veteran, an advertising executive, and his father’s successor as president of Del Monte Properties, before he became a full-time artist in 1953. 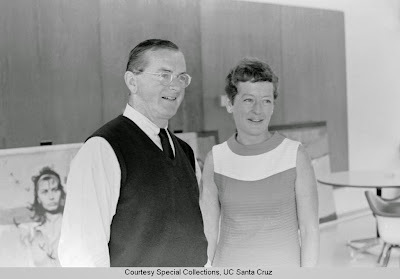 He was prominent as a philanthropist and artist in the Monterey Bay area. For more information about this exhibit, see the Santa Cruz Sentinel, September 17, 1967, p. 27, and September 24, p. 27. Branson and Elsie DeCou visited the young Soviet Union around 1931, taking pictures in Moscow, St. Petersburg (Leningrad), Odessa, and Yalta (the latter two now in Ukraine). 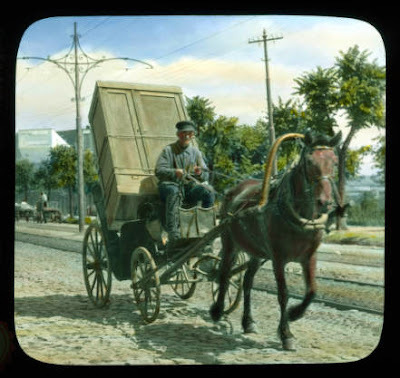 Although most of the images show buildings and museums, many of them are street scenes or character portraits. These offer a unique and interesting glimpse of daily life in the Soviet Union between the two world wars. Photometry is a way to study stars by measuring the intensity of their light. 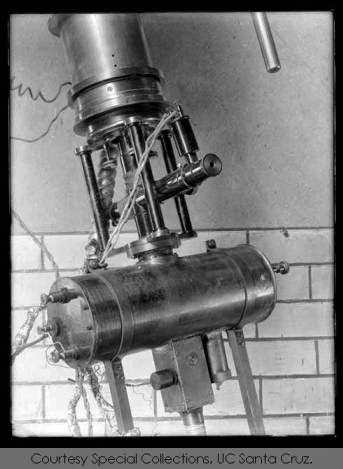 Dr. Joel Stebbins (1878-1966) brought the Illinois photometer to the Lick Observatory to study Beta Lyrae, a binary star system. 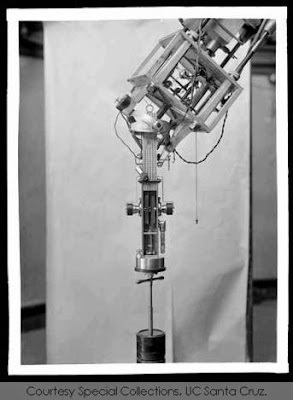 The director of the observatory, William Campbell, sought to obtain a permanent photometer. Edith Eleanor Cummings, a Lick Fellow, designed one for her doctoral studies at Berkeley, and in 1921 used it to study Beta Cephei. Her research revealed this triple-star system as a prototype for a new class of stars, ones with brightness that varies according to pulsations on their surfaces. See Biographical Encyclopedia of Astronomers, pp 2048-2051 for Joel Stebbins, and pp. 485-487 for Edith Eleanor Cummings. 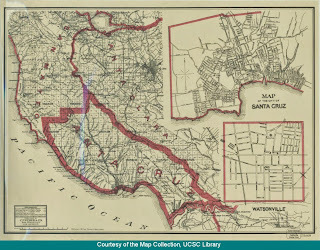 UCSC Library Map Collections. Weber's map of Santa Cruz County, California / Published by C.F. Weber & Co., 1914. This map shows utility lines (gas and electric), railroads, wagon roads, schools, ranchos, townships, reclamation districts and irrigation projects. 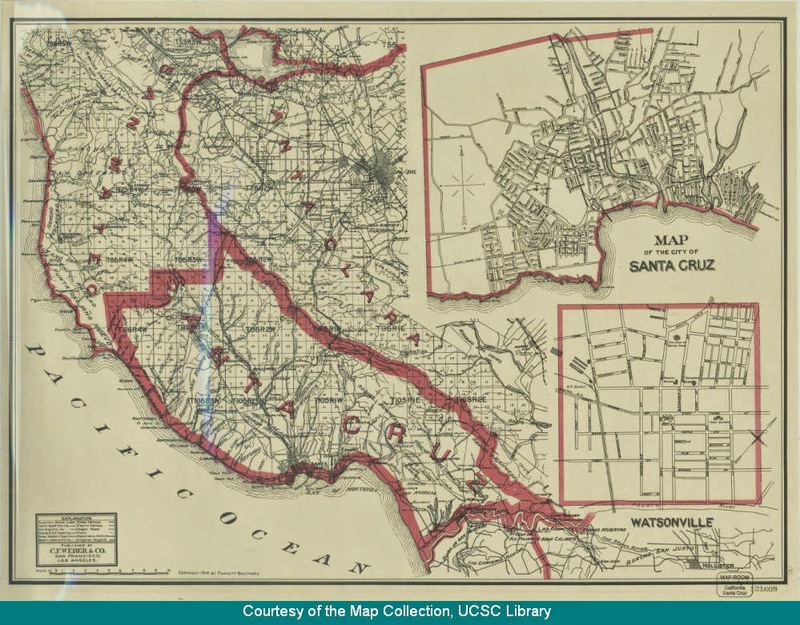 It includes insets of the cities of Santa Cruz and Watsonville. In 1969 Sheldon Feldner, UCSC Professor of Theater Arts, decided to stage Shakespeare's Julius Caesar. He had recently become a fan of Marvel Comics, and on a whim, he wrote to the president of the company, Stan Lee. Lee referred him to famed Marvel artist Jack Kirby, who had recently moved to Irvine, in Southern California. Kirby was happy to collaborate, providing costume sketches and a design for the publicity poster and program. The University Theatre Company performed the play May 15-25, 1969. The Cowell yearbook of 1969, "Markings", contains two pages of photographs of the production, and our "UCSC Campus History" collection includes several behind-the-scenes photos. The best discussion of Kirby's role, however, is at the Kirby Museum weblog. They have published many of the costume designs in color, along with press clippings. Check it out! 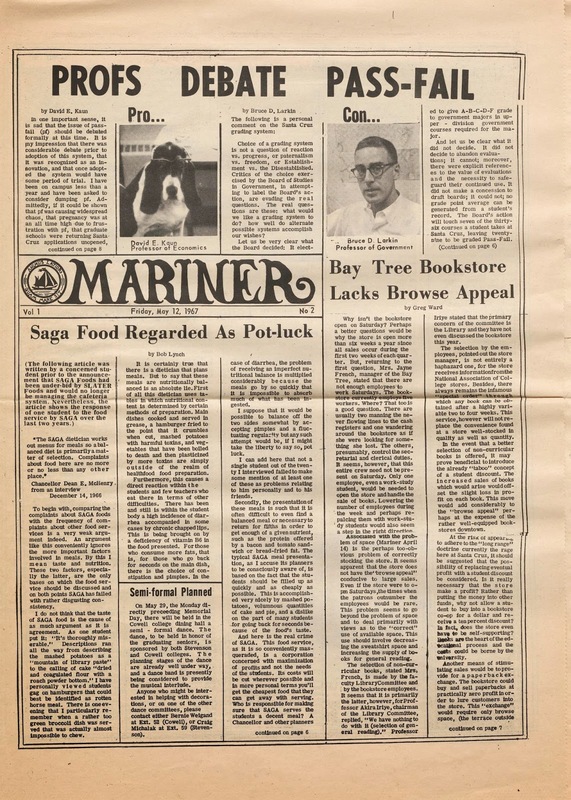 In 1967 a group of student journalists, dissatisfied with the City on a Hill Press, began an alternative newspaper, The Mariner. The venture lasted only for a year or so, and the writers returned to City on a Hill Press. The seven issues of The Mariner that we’re posting have articles about the usual concerns of students: bad food service in the dorms, the role of the campus police, town-gown tensions with Santa Cruz city and county, budget cuts and rising “fees” for the UC system. They also illustrate some particular growing pains of the two-year-old university, with discussions about: the grading system (pass/fail and narrative evaluations), the planning of the Engineering Unit, the experiment in student-taught classes, attempts to create a student government for the campus as a whole, and the policy of dogs living in the dorms on campus. There was student activism, of course, with articles addressing events of the late 60s, including the Vietnam War, the trial of Huey P. Newton, and the presidential election of 1968 (with students organizing for Eugene McCarthy or Robert F. Kennedy, even though the voting age would not be lowered to 18 until 1971). There is an article about the Koinonia Coffee House in Santa Cruz (February 9), one about the path of the prospective freeway joining Highways 17 and 1 (April 24), and advertisements for local businesses in all the issues. The co-publication, Mariner Activities Bulletin, lists arts, lectures, and social events that took place on the campus. The Mariner offers a vivid glimpse of UCSC in 1968, when there were only three colleges (Cowell, Stevenson, and Crown) and the student population was only around 1,825 undergraduates. Check it out! 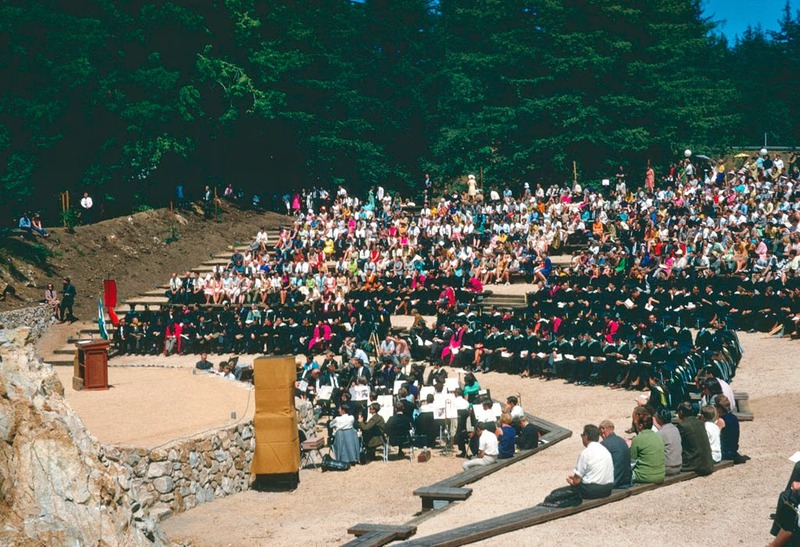 1968 Commencement in the Quarry Amphitheater. Peggy Long Photographs, No. 292.